The song cycle album is a concept that has caught on well, offering many fine albums since the days where the ‘rock opera’ helped burgeon in full album concepts. Kevin O’Donnell has done this style proud with a lovely Irish folk affair documenting multiple generations of Irish immigrants in Illinois. This is all historical fiction, but through both his music and storytelling, you may have the feeling that you have heard some of these songs before. You get a full Irish feeling throughout although it does have an even stronger Irish-American hybrid sound. I would say the music leans more Irish mostly, but the vocals have the rich timbre of a classic country and western crooner. The CD release also contains keys for multimedia files at the album’s website which fleshes out the songs further. It is nice to see so much thought and effort being put into a release and thankfully the music holds up to the storytelling. There is a fine team assembled to create this music and it is nice to see the name Finbar Furey among the players. This entry was posted in Review on March 26, 2014 by FalconAndFox. through today is the story of many of us whose ancestors arrived here awhile back. weave his magic around you. It will be a trip you’ll remember. This entry was posted in Review on May 9, 2013 by FalconAndFox. 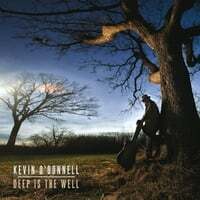 Following a number of recent concept or themed albums we have this much anticipated release from Kevin O’ Donnell called Deep is the Well. Kevin has been on a 15 year hiatus from music and has spent the intervening time acting in various stage shows as well as following his passion for writing. A chance encounter with Maurice Lennon re ignited his desire to get back into the studio. With Maurice’s promise to produce this record the opportunity could not be passed up. The resultant songs represent a fresh perspective on the American experience over a 170 year period as told by a multi-generational family of Irish descent, and is a work of historical fiction. In addition to Maurice Lennon on the album you also have Finbar Furey, John Williams and Jessica Willis. Chicago musicians Jim DeWan, Kathleen Keane, John Rice, and Larry Grey also add their weight to the project. The album features 10 new compositions and opens with a poem set to music. It’s called A Letter Home and it draws you into the journey that is slowly revealed over the rest of the album. Within this poem is a reference to those Irish born in the US stating ” their love seems far more intense, if that is possible, than the affection of those who were born in Ireland” This resonates a bitter truth about the effect of emigration over time, with identity torn between a spiritual home and a material life on a foreign shore. Be it on the railroads of North America or the tunnels of London the fire that burns within is the same. This can result in artistic expression that manifests itself as music and song, feeding like a virus down through the generations. Kevin assumes the position of narrator delving into these themes, finding a musical catharsis for himself and others in the process. It is stirring stuff indeed with the strength of his writing at times hitting hard. Small town confinement is explored on Factory Girl where “the bend in the river is the edge of her world” and the bells from the “old weary cathedral drift over the town” In Downtowner Motel memories of the good times for William Fagan are mixed with the harsh reality of isolation and “if next year the lakes haven’t claimed him then the whiskey most certainly will.” And on we go through love, loss and yearning as the stories unfold and reveal life won and lost. Some great songs including the closing Saint Malachy’s Waltz and a Marty Robbins inspired Girl from Durango that explores chance encounters. Lyrically strong and musically, at the level you would expect with Maurice Lennon involved, it is a record that has depth and emotion within its many hidden layers. Thoughts of the forgotten Irish in the bedsits of Kilburn and Kentish Town come to mind, the plight of which would surely reveal a narrative that is just as compelling. Deep is the Well is thought provoking for sure and is a worthy vehicle for the return of Kevin O’ Donnell. This entry was posted in Review on May 2, 2013 by FalconAndFox. This entry was posted in Review on April 26, 2013 by FalconAndFox. There are recordings that accomplish the purpose of entertaining. There are those that serve to tell. Deep is the Well by Kevin O’Donnell accomplishes both of these aspects. The album reads like a biographical book as it explores the lives of Irish immigrants to the United States. Those who are fascinated by Irish history and the American Antebellum period will take this album close to heart as any jewels uncovered from the treasure chest. This entry was posted in Review on April 13, 2013 by FalconAndFox.